Today we have visitors arriving from the States, they are coming to cuddle there granddaughter who was born here three weeks ago. They are bringing their daughter with them- she has cancer. Many years back I journeyed with a teacher who watched as his daughter fought cancer, the battle was furious and she lost. It was such a painful experience and so hard to know how best to journey with them. Oh if we could stop the pain of cancer, if we could do something, anything to halt its destructive path. Jack saw, he watched and he did! In this book, teen innovator and scientist Jack Andraka tells the story behind his revolutionary discovery. When a dear family friend passed away from pancreatic cancer, Jack was inspired to create a better method of early detection. At the age of fifteen, he garnered international attention for his breakthrough: a four-cent strip of paper capable of detecting pancreatic, ovarian, and lung cancers four hundred times more effectively than the previous standard. Jack's story is not just a story of dizzying international success; it is a story of overcoming depression and homophobic bullying and finding the resilience to persevere and come out. His account inspires young people, who he argues are the most innovative, to fight for the right to be taken seriously and to pursue our own dreams. Do-it-yourself science experiments are included in each chapter, making Breakthrough perfect for STEM curriculum. 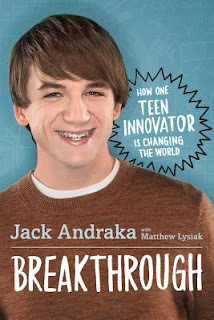 But above all, Jack's memoir empowers his generation with the knowledge that we can each change the world if we only have the courage to try.